During the mid 1800’s Victorian industrial era the demand for assembly line meat packing lines increased. Advances in firearm and ammunition developments quickly led to the obsolescence of Poll Hammers and the introduction of clean, effective and rapid slaughter using “Humane killers”. “Greener’s Humane Horse (or Cattle) Killer” was one of the very first practical free bullet killers. It was introduced in 1865, almost as soon as practical self contained ammunition came onto the market and remaining as some have called it a ‘smashing’ success right through to the 1970’s. 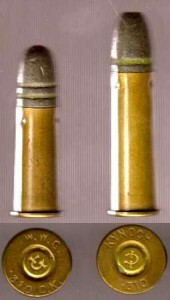 These free-bullet killers were essentially small caliber pistols designed solely for the purposing of putting animals down by firing a bullet directly through the brain and into the spine. Therefore placement of the muzzle was critical in causing with such a small bullet a humane and instant result. These humane killers were designed with a muzzle (gun metal bell) shaped to provide the correct bullet entry angle and supplied with instructions to ensure it was placed on the animal’s head in the correct spot. 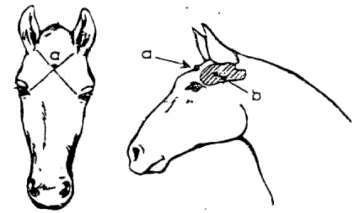 For horses the ‘sweet’ spot (a) was where an imaginary line from each ear base to the inside of each eye intersected. Greener’s Catalogue listed the Pocket Pattern for Veterinary Surgeons’ and Slaughterers’ use and issued it in a box complete with a cleaning rod and brush. Instructions stated that the interior of the barrel and expansion chamber should be cleaned after use with the Rod and Brush supplied lubricating with suitable oil such as petroleum or Rangoon oil. While Greener’s Humane Killers are the best known, Greener was not the only manufacturer of free-bullet killers. The Folding Pocket Model was small enough to carry in the vet’s bag. In the first half of the 20th Century virtually every country and racecourse veterinarian carried one. All armies had cavalry units in WW1 with most of the European countries continuing in to WW2 and they also relied on horses to haul supplies and heavy weapons. The Pocket Model Humane Killer was standard issue to farriers and vets in the British Army. 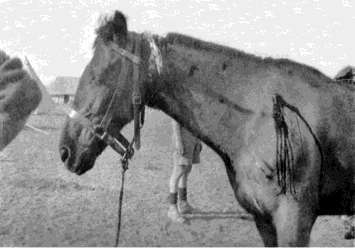 The NZ Veterinary Service was issued the Pocket Humane Horse Killer at the Four NZ Remount Stations (Palmerston North, Upper Hutt, Islington (ChCh) and Dunedin), on board the transport ships and in training and at the front in Palestine and France. The Horse Killer has a muffler bell much smaller to the Cattle Killer. Shown in the picture below, the Pocket Model is designed in such a way that everything fits into a package 6.5 inches (165mm) long. The issued ‘Killers’ were Broad Arrow stamped, image right, and likely issued with a holster, doubled sided bandolier carrying 14 rounds and an expansion chamber cleaning rod and brush. It is also possible that the leather gear found with this Killer is private purchase to a military issue standard. When assembled the ‘Killer’ is 10.25 inches (260mm) long. 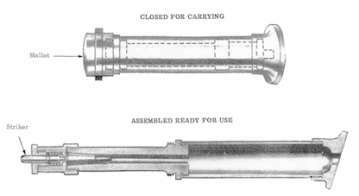 The firing mechanism is a spring-loaded firing pin screwed onto the breech after a cartridge is inserted. The bell is placed on the animal’s head, and the firing pin struck smartly with the “mallet” to discharge the round. Even though they weren’t regarded as firearms, the ‘Killers’ had to be tested at the Birmingham Proof House. They bear serial numbers and a single proof mark with mine stamped #5505 and a proof mark that was used by Birmingham between 1868 and 1925 supporting the notion that this Killer was issued and in use during WWI. These Killers were chambered for the .310 Cattle Killer round which was essentially a shortened version of the “.310 Cadet” round used in small frame Martini rifles. The .310 Cadet military issue round isn’t easy to find these days but .310 Cattle Killer is far scarcer, thanks to its limited use and production. It hasn’t been produced since the late 60’s. Cattle Killer, case length – .855 inches, overall length – 1.325 inches, head stamped WWG 310 CK (W W GREENER CATTLE KILLER) Imperial Chemical Industries (KYNOCH). ICI monogrammed primer. .310 Cadet Ball round, lead hollow point, case length 1.150 inches, overall length 1.575 inches, head stamped KYNOCK, ICI monogrammed primer. Superficially the .310 CK round was very similar to the .32 S&W Long, though the dimensions are different enough that the latter will not chamber in the Killer. 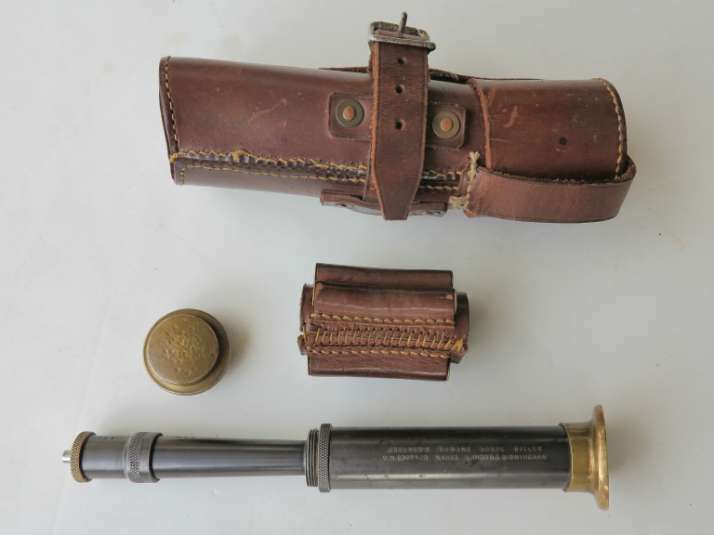 It has a “heeled” bullet of the same outside diameter as the cartridge case, with a waxy exterior lubricant. The .32 S&W Short will chamber in my Killer and so will a .32 ACP. I have never fired either one of these alternatives and I’m certainly not about to shoot off my small number .310 Cattle Killer rounds nor the 14 .303 adaptor rounds that sit snuggly in the bandolier! This raises the question why this ‘Killer’ complete with its issue holster and bandolier contains .303 adapter rounds. It is possible that the vet was issued or had access to adaptor rounds during service. It is also possible and probably more likely that post service an owner (likely a vet) had access to the adaptor rounds. In either case both the .310 Cattle Killer and .303 Adaptor rounds are hard to find with a full box of either rare and worth substantially more than the Killer itself. 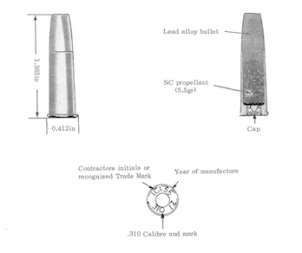 The NZ Army Ammunition and Explosives Regulations record right through to the mid 1970’s that only one design of the .310 Horse Killer MK IZ Ball round had been approved for Land Service. 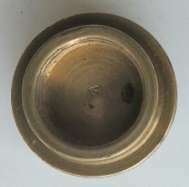 The round ignited by a fulminate cap used 5.5 grains of Nitrocellulose propellant pushing a 125 grain lead alloy flat nosed bullet (refer sketch below). 100 years on as we commemorate the suffering and sacrifice of the 65 million who mobilised in WWI we are also reminded of the over 8 million horses that died by enemy action, disease or accident in WW1. Lets not also forget the significant numbers of horses and pit ponies that toiled above and below ground as war workers carrying and dragging immense loads in support of the war effort. 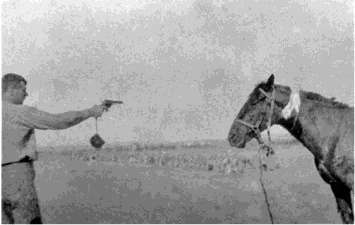 While most injured horses were ‘put down’ in the field by their devoted Trooper, using his side arm (revolver or pistol) the Humane Killer was used for horses that were attended to by a member of the Veterinary Service. The horse above bleeding from many bullet holes almost looks resigned to its fate. 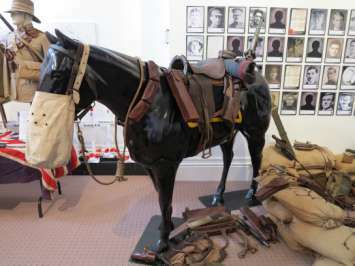 The Greener Humane Horse Killer in this article has featured in the many WW1 NZ Mounted Rifles displays I’ve put on in the last 6 months featuring the equipment carried by the horses and used by those who served with them. Many people wanted to find out more about the ‘Killer’ and winced visibly when I assembled it, held it on the mannequin horse’s sweet spot and demonstrated with a sharp blow of the mallet to the firing pin that the bullet having passed through the brain into the spine ended instantly and humanely the life of an injured, sick or stricken horse. Thereza Rosanowksi , Malcolm Brady, Alwyn Davies, Paul Shoebridge, Tony Sillers, David Theyers and Rod Woods. Bang! You’re Dead – A Primer on Humane Animal Killers, accessed from: http://www.nrvoutdoors.com/HUMANE% 20KILLERS/BANG.htm, 2015. Greener, W. W. (1914), Handbook: Greener Instantaneous Killers for Horses, Cattle, Sheep, Pigs and Dogs. Greener Ltd, Birmingham. 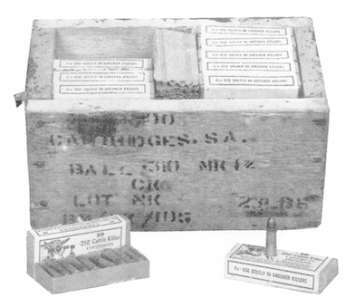 International Ammunition Association – .310 Rook with .750 Case, accessed from: http://iaaforum.org/forum3/viewtopic.php? f=1&t=4369, 2015. MacNaughten, L. (1932), Pistol v Poleaxe-A handbook of Humane Slaughter. Chapman & Hall Ltd, London. Moss, A.W. & Kirby, E. (circa 1950), Animals Were There- A record of the work of the RSPCA during the war of 1939-1945. Hutchinson & Co, Great Britain. New Zealand Ministry of Defence (March 1974), Ammunition and Explosives Regulations, Volume 3 Pamphlet 14, Part 2 SAA categorized by Inches, New Zealand Ministry of Defence, Wellington, New Zealand. NZ’s First World War Horses – New Zealand History, accessed from: www.nzhistory.net.nz/war/nz-first-world-war-horses, 2015. Wirnsberger, G. (1975), The Standard Directory of Proof Marks, Jolex Inc, New Jersey, USA.